A few showers early, then clear overnight. Low 47F. WNW winds at 10 to 20 mph, decreasing to less than 5 mph. Chance of rain 50%..
A few showers early, then clear overnight. Low 47F. WNW winds at 10 to 20 mph, decreasing to less than 5 mph. Chance of rain 50%. Walker High's Brian Thomas (4) splits a pair of Ouachita defenders Thursday in Charquez Owens (1) and Matt Hayman (30). Walker High's Jalen Cook (14), who scored 37 points in Thursday's state semifinal, celebrates one of his six made 3-pointers. Walker High coach Anthony Schiro: “If you get to this point and you don’t finish the deal, it’s still going to leave an empty feeling." LAKE CHARLES - Not that he’s overly superstitious, or fashion-conscious about uniforms, but coach Walker High’s Anthony Schiro knows good things happen when his Wildcats wear green at Burton Coliseum. 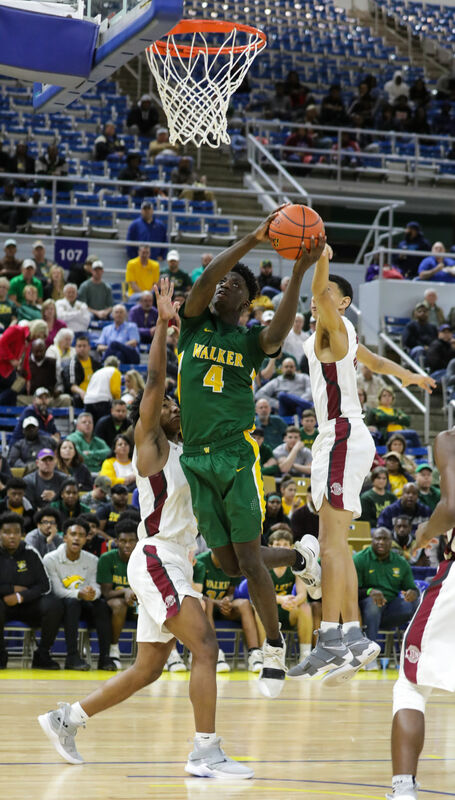 For the fourth straight time, a span covering its last two state tournament appearances, Walker will slip into its all-green attire with the objective of bringing home the gold when the No. 3 Wildcats (28-9) meet No. 1 Thibodaux (32-2) at 6 p.m. in Saturday’s Class 5A state championship game. 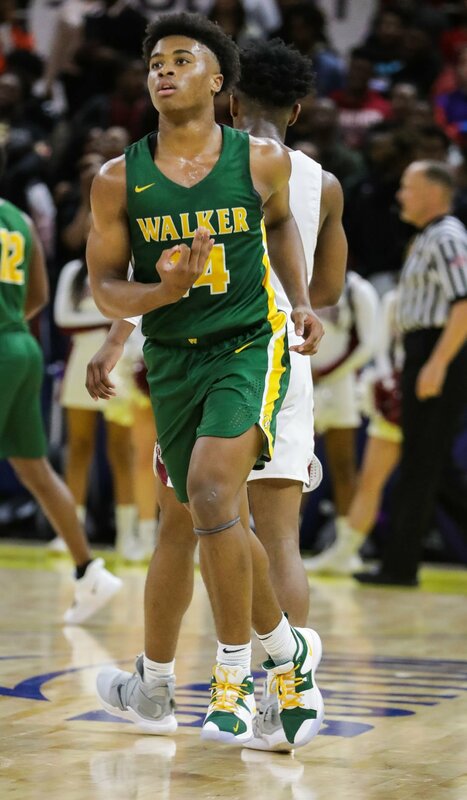 After 62 years in between state tournament appearances Walker, which is riding a 10-game win streak, looks to win consecutive state championships and become the first team since Scotlandville to repeat the feat in Class 5A in six years. “There’s always pressure to get back,” Schiro said. “That’s the goal every year anyway and that’s to be where we are and give ourselves a chance to have a state championship. When you have a good team that’s what your goal is. Thibodaux, which was eliminated 61-55 in the regional round of last year’s state playoffs, exacted a measure against Bonnabel in Thursday’s 63-48 state semifinal victory. The Tigers, who are in their third state tournament, have never won a state championship, making the program’s first title appearance since a runner-up finish in 2005. Thibodaux carries an 18-game win streak into the state championship game. The Tigers dropped games within a two-week span in December to New Iberia (48-32) and St. Augustine (89-55) but haven’t looked back and rolled through their District 7-5A season with a perfect 12-0 mark. Thibodaux has proven to be comfortable in tight games, squeezing past district foe Hahnville (70-68) in the regional round and No. 9 Natchitoches Central (67-62) in the quarterfinals. The Tigers rode a see-saw in Thursday’s semifinal against Bonnabel, leading 35-24 at halftime, only to fall behind 37-36 with a couple of starters on the bench because of foul problems. Junior forward J’Mari Carter scored seven of his 16 points during a 23-9 run in the fourth quarter that helped propel Thibodaux which had a total of four players scoring double figures. Senior guard Marvin Robertson’s 16 points tops a balanced offense for the Tigers, while senior guard Rashod Robinson averages 13.6 points. Walker showed similar resiliency in having to rally from a pair first-half, double-digit deficits. They did so behind the superb play of junior guard Jalen Cook, who led all scorers with 37 points that included six 3-point baskets. Cook, who averages 28.8 points for the season, was the only player from his team to crack double figures. Sophomore forward Brian Thomas had seven points and seven rebounds in 28 minutes because of foul difficulty. Cook scored 12 of his game-high point total during the fourth quarter, but it was the effectiveness of Walker’s defense that limited Ouachita to three field goals and only nine points in the fourth quarter. A step-back 3-pointer by Cook from the top of the key gave Walker the lead for good with 3:25 left in the game.